Democrat (Term Expires: 2022) serving Delaware (part) and Philadelphia (part) Counties. 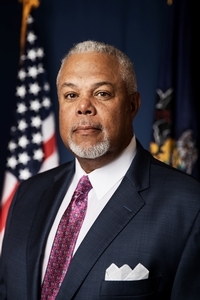 Williams, Anthony H. (D) (2006)- Delaware (part) and Philadelphia (part) Counties - State Senator; s. Hardy, and Mrs. Carole Williams-Green; g. Franklin & Marshall College, B.S. in Economics; m. Shari, Aug. 26, 1995; chrm. Black Elected Officials of Philadelphia County, 2004; co-founder Neighborhoods United Against Crime and Diversity Apprenticeship Program (DAP); co-chrm. Philadelphia Delegation, House of Representatives, 1991-1998; founder Philadelphians Stopping Crime & Violence, Urban Mass Transit Task Force, 1999, Philadelphia Revitalization and Education Task Force, 2000; South/South West Environmental Cooperative, 1998; pres. Renaissance Advantage Charter School, 1999; bd. dir, Organized Anti-Crime Community Network, Cobbs Creek Black Family Services Inc.; mem. PA Legislative Black Caucus; and Greater Philadelphia Urban Affairs Coalition; fmr. bd. mem., SEPTA, West Branch YMCA; fmr. trustee Temple University; fmr. member, Pennsylvania Council on the Arts; mem. Ethics and Official Conduct Committee; mem. Policy Committee; mem. Legislative Data Processing Committee; Member of House 1989-1998; Member of Senate 1999 to date; elected Minority Caucus Chair 2011.